Coming from a telecommunications company and attending a conference entitled Water Cooperation – Building Partnerships, I find this an appropriate quote with which to open. It is true that while we can attribute some of the greatest inventions of our time to individuals, it is hardly those individuals alone who achieve them. This is especially true when tackling the challenge to protect and preserve a shared resource such as water. A new toolkit from AT&T and EDF can help reduce water consumption in buildings with cooling towers. For full size, click here. At the World Water Week conference in Stockholm, Sweden this week, I will be speaking about a year-long project that we undertook in collaboration with Environmental Defense Fund. Through the cooperation of many minds, including groups like Pacific Institute, we developed a toolkit that could save U.S. commercial and industrial sector buildings 28 billion gallons of water per year – that amount of water is equivalent to the entire city of New York not showering for nearly a year. As a technology company, you might not first associate AT&T with water. Our journey began when we developed our first water footprint in 2010 and found that 125 buildings – representing a fraction of our total portfolio – consumed 50 percent of our water. Upon further investigation, we found that these 125 facilities had one thing in common – they all used mechanical cooling systems with cooling towers. These cooling towers use water, for example, to cool the buildings that house our network equipment. They also use water to keep our employees cool in large office buildings. In fact, an average large office building devotes more than one fourth of its water use to cooling. Yet we found very few practical and usable resources about water efficiency in cooling systems. Seeing this as an opportunity, we approached the environmental nonprofit Environmental Defense Fund (EDF). With them, we began a one-year trial of several pilot sites to see which methods would be most effective in reducing water use in our cooling systems. The findings were encouraging. Through improved technologies and the use of free air cooling (pulling cool air from the outside to cool the building), we were able to find anywhere from 14-40 percent water savings at each pilot site. One cooling tower filtration system upgrade costing less than $100,000 produced more than $60,000 in annual water and sewer savings – paying for itself in less than two years. A minor $4,000 equipment upgrade to expand free air cooling produced nearly $40,000 in annual savings. These savings, when deployed across an entire portfolio of buildings, can add up. Over the fall, we will be working with EDF and others to get the toolkit into the hands of those who can use it – building managers, real estate executives and other business and government leaders. At AT&T, we are already utilizing many of the tools and will continue to deploy them at our 125 water-thirsty facilities. 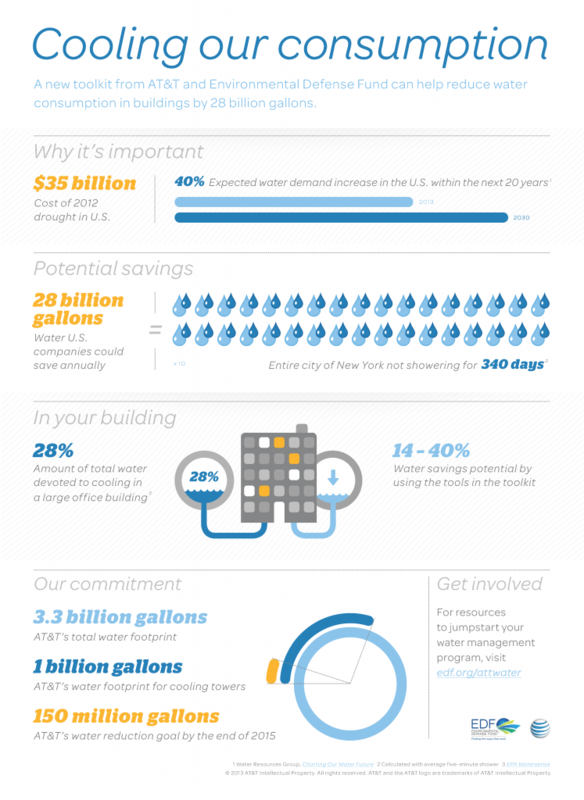 We also set a goal to realize 150 million gallons of water savings per year by the end of 2015. We encourage you to check out the toolkit for yourself, help spread the word, and jump-start water management programs in your own organization: www.edf.org/attwater. Together, with our continued collaboration, we can be smarter about how we use and preserve this vital shared resource for generations to come. The views and opinions expressed in this guest blog are those of the author and do not reflect an endorsement or official policy or position of the Pacific Institute.